The Hubs and I were browsing the coffee aisle at a market in San Mateo and asked a stranger a coffee question. Turns out he owned a coffee biznaz and he was popping up shop at San Mateo’s First Friday that night. Whaaat? We totally walked on over to check it out. The Shop host’s the event and features local makers & artists, food & drink, and music. I felt all the local love; everyone knew someone and if you didn’t you sure felt like you were part of the in crowd. Leo, owner of Killer Coffee, was that stranger we met in the coffee aisle. Most days he pops up at Shane’s Barbershop, but tonight he was making coffee for the First Friday crowd. I tried his iced coffee which totally tasted like coffee ice cream – my favorite flavor! I don’t normally have coffee; I might now be addicted. We also picked up some of his coffee beans and can’t wait to brew them at home. We also met Laurel of Laurel Elaine Jewelry. She makes simple, beautiful pieces. Love! I purchased one of her wire wrapped vintage button rings. She didn’t have my size with my button of choice pre-made, so she made one for me on the spot. It was awesome to watch her create in person. Also, check out her creative book display. 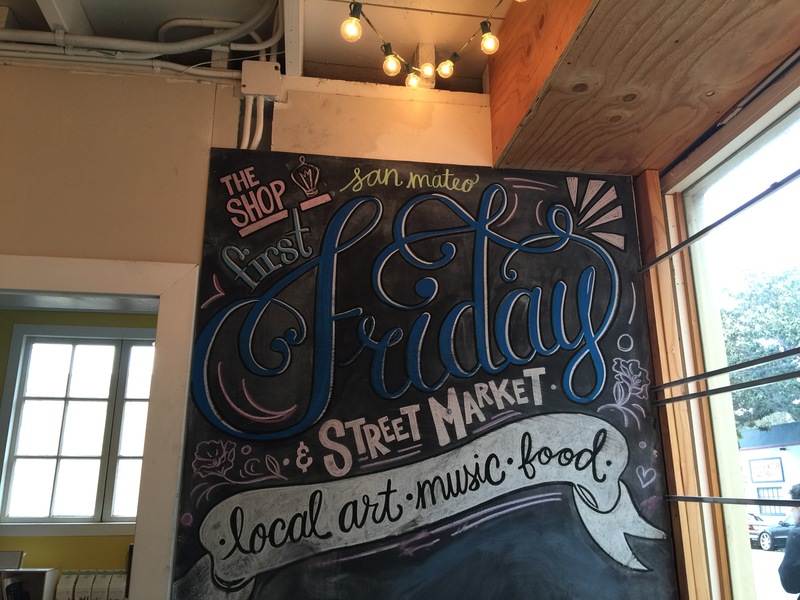 Where do you like to First Friday? Share below!